Hello, this is Riddick of Black Dog Farm. This picture is titled: Its good to be king! 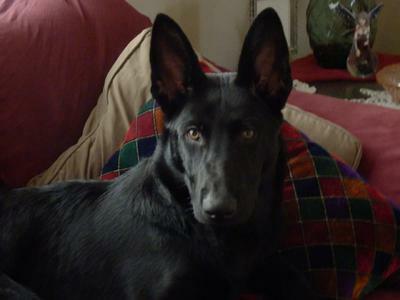 Riddick is a 6 month old all black German Shepard from Black Dog Farm! My name is Wendy Helms,Riddick and I are members of the Phoenix Schutzhund club currently training in Obedience,Tracking and Protection. Riddick has been bred to be a working dog. Both Riddick and I love training together and hope some day to get akc titles as well Schutzhund titles. Riddick is the king of his castle, very intelligent,elegant, and loved by everyone in his family. He is my first German Shepard. He is fun ,curious, smart and funny. We both hope to get picked for this contest. Thanks for your time and consideration! Beautiful Black German Shepherd!!! Look at those beautiful ears and what a big nose he has, Gorgeous! German Shepherds are Amazing so protective, loyal, trustworthy and most of all, loving. I sure he will excel in all his training. Good luck, Riddick! Take care of your boy Riddic and he will take care of you.